The setting for 7th Sea, the roleplaying game of swashbuckling and sorcery published by John Wick Presents is the land of Théah. Yet there are lands beyond Théah, which the publisher is only beginning to address with the supplement, 7th Sea: Crescent Empire, which explores the lands immediately to the east of Théah. Yet there are lands beyond this, far to the east—Khitai. Although Khitai marks the return of the designer to the same genre as his highly regarded Legend of the Five Rings, that is, Asian fantasy, 7th Sea: Khitai is different in that it does not dwell solely on its Japanese and Chinese influences and sources. Instead, it encompasses numerous sources and influences and encompasses numerous nations and cultures, from China, Japan, and India to Cambodia, Australasia, and Oceania. Much of the pleasure of seeing these nations and cultures included is that many of them are rarely visited by roleplaying. The first taste of Khitai comes in the form of 7th Sea: Khitai Quickstart, which includes an overview of the setting and its themes along with a complete adventure. On a very personal level, the difference in themes between Théah and Khitai is twofold. The first is that the heroes—or player characters—are not driven to adventure, but pulled by the Call to Adventure, a very real, spiritual urge to fulfill their destiny. This call is made by the Song of the World and places a duty upon the heroes that is much greater than their personal desires. The second is that in Khitai, honour is supernatural rather than personal. 7th Sea: Khitai uses the same mechanics as 7th Sea. These are essentially ‘roll and pair’, the players and the Game Master rolling pools of ten-sided dice to create ‘pairs’ of one, two, three, or more dice that each add up to ten or more. Each ‘pair’ is a Raise, which are spent to carry out actions in Action and Dramatic scenes. For the player characters, these pools are created from a combination of a character’s trait plus skill, for example, Honesty + Convince or Peace + Brawl. These combinations are called Approaches, which define how a character will do something. For example, Joy + Weaponry if a character wants to smash his way through a Brute Squad—the equivalent of a band of minions or goons or guards in Khitai—using her tetsubo or Wisdom + Mysticism if a character wants to search his memory for what he knows of a particular Kamuy or nature spirit. Bonus dice are rewarded for varying a character’s Approach from action to action and for providing an engaging description of said Approaches. In comparison, the Game Master rolls a pool of dice equal to the Strength of the Villain or Brute Squad. In a scene, Raises are then spent to inflict or block damage, to avoid Consequences—bad things that might happen to a character, to purchase Opportunities—advantages and bonuses that a character can find or gain in a scene, and to discover clues in a scene. Although the dice rolling mechanic is very much that of the traditional roleplaying game, the application is much more akin to that of a storytelling roleplaying game. There is one change in the rules between 7th Sea: Khitai and 7th Sea, a rule that the Game Master can import back to 7th Sea if he so desires. This is how Brute Squads work and the rule change makes them much more of a challenge. In combat in 7th Sea, a Brute Squad inflicts wounds, one wound per Raise, which a character counters with his Raises also on a one-for-one basis. In Khitai, when the Game Master spends Raises for a Brute Squad, it does not inflict Wounds on a one-for-one basis, but rather inflicts Wounds equal to the current Strength of the Brute Squad. The character can still counter this attack with a Raise and so block the Wounds. The 7th Sea: Khitai QuickStart introduces the setting and its rules in smart fashion. Barring the change in how Brute Squads work, the Game Master and his players will have no issue with the rules if they have played 7th Sea. Likewise, someone new to both 7th Sea and Khitai may not adjust as easily to the roleplaying game’s more storytelling rules if they are used to traditional games. Even though there is a limited amount of space in 7th Sea: Khitai Quickstart, it could have done with deeper examples of play, especially given the switch it makes from traditional to storytelling roleplaying games. This is because it makes a radical change in the names it gives the player characters’ Traits. In 7th Sea, these are Brawn, Finesse, Resolve, Wits, and Panache—a very traditional set of characteristics and easy to apply. In Khitai, the Traits are Compassion, Honesty, Joy, Loyalty, Peace, Respect, and Wisdom. Now a character only has five of these seven, these five being the ones they value, but they are more conceptual in nature and not as easy to apply on a case by case basis. There are seven nations described in Khitai, but only two are detailed in the 7th Sea: Khitai QuickStart and visited in the adventure, ‘Life-Giving Sword, Death-Giving Sword’. The first nation is the island archipelago of Fuso, known for the rift between its traditional shaman-chieftains and the upstart warlord leaders, or daimyos, the most ambitious of which would rule not just Fuso, but all of Khitai. The shaman-chieftains are also capable of talking with the kamuy, which are natural spirits, guardian angels, ancestor spirits, and so on. In this, Khitai draws from the Ainu mystical tradition rather than from the Kami and mystical traditions of Japan. The second nation is the Kingdom of Han, noted for its scholastic and artistic excellence—as well as the literacy of its people—though riven by nepotism and corruption, including in its military. ‘Life-Giving Sword, Death-Giving Sword’ is a three act scenario, a tale of love, greed, and revenge. The heroes are travelling when they realise that they are close to a monastery where they sheltered before, but upon arriving at its doors, they find that it has literally just burned down. Investigation reveals that it was no accident and worse, an ancient and mystical blade is missing. Duty bound, the heroes must follow the thief across Fuso and beyond, harried by assassins and bandits along the way. Alongside the combat, there are scenes involving investigation, persuasion, and negotiation, so there is plenty of opportunity for the heroes to exercise their skills and do so creatively. Overall, ‘Life-Giving Sword, Death-Giving Sword’ is a very straightforward scenario, almost linear, and presented in a step-by-step fashion. This makes it easy to run and the Game Master should have no issues running the scenario. Rounding out 7th Sea: Khitai QuickStart are five player characters, ready to play ‘Life-Giving Sword, Death-Giving Sword’. They include a female mystic and clan heir, a male samurai advisor and duellist, a female warrior monk, a male courtier from Han, and a male spymaster, exiled from another nation, Shenzhou. This is a good mix and they are clearly presented and laid out, with clear explanations of their abilities and their advantages. 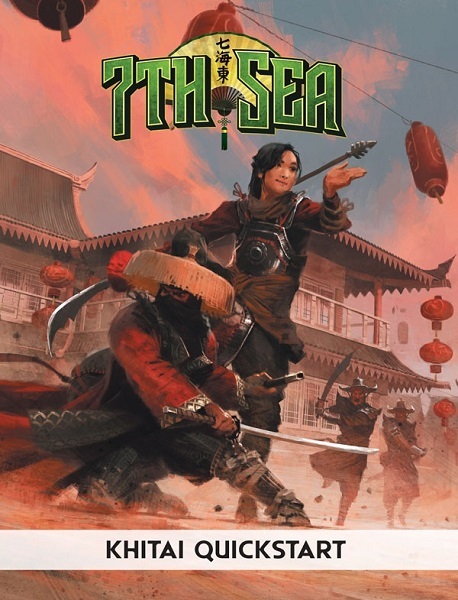 Physically, the 7th Sea: Khitai QuickStart is a well presented and easy read. The writing needs an edit here and there, but this is a minor issue. Much like 7th Sea, the 7th Sea: Khitai QuickStart is superbly illustrated in full colour with great artwork that captures some of mysticism and action of the setting. If the 7th Sea: Khitai QuickStart has an issue, it is that it does not address the honour as supernatural aspect of the setting as well as it does the Call to Adventure. This though, will not stop the Game Master from successfully running the scenario and the players from enjoying it. This is an excellent scenario and should provide an engaging session or two’s worth of roleplaying and excitement. Not too complex and with the right mix of ingredients and challenges, 7th Sea: Khitai QuickStart is an excellent introduction to Khitai and a good option for a group looking for a one-shot or a taster. 7th Sea: Khitai is currently funding on Kickstarter.